Do you find yourself asking how you can leverage all your data for more intelligent Customer Engagement? How do we quickly learn about a customer’s journey given the information spread across our transactional systems, CRM applications, Web stream logs, Social feeds and in some cases IoT data? How will we put together a unified view of the customer when these systems have different ways to identify the same customer? How do we scale to manage and analyze the growing volumes of data we collect? How do we keep our insights up-to-date with the most advanced analytics and the latest data available across our enterprise? 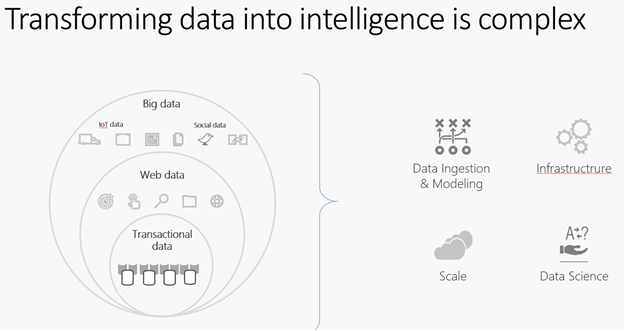 Transforming data into actionable intelligent insight has several challenges. Joining together data from multiple structured and unstructured sources with different identities is complex. It requires elaborate computational, storage and processing infrastructure that can scale to the ever-growing volume of your data. Also, valuable data science resources should be focused on critical business problems rather than data wrangling. What if, there was a service that understands the way data is stored in different data systems, brings together this data easily with near-instant updates and makes it easy to apply pre-packaged analytics that allows you to develop an always up-to-date customer profile? Microsoft Dynamics 365 for Customer Insights is that service for you. It is a cloud-based SaaS service that enables organizations of all sizes to bring together data from multiple sources and generate knowledge and insights for your business. 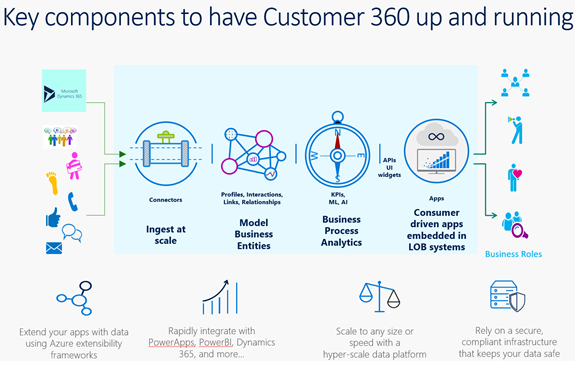 Customer 360° is first among the many Big Data Analytics apps that is built on Customer Insights and is currently available for public preview. In the near future, more will be available on top of the Customer Insights service. A data connector facilitates data source connection and data pull to Customer Insights. Profiles, Interactions, KPIs, Links and relationships are the foundational pieces of Customer Insights through which the data model is constructed. KPIs can be defined for each step of a business workflow or for a cumulative measure of a business function. Customer Insights can compute these KPIs in real time.